The release of the Canon EOS RP did not shake the camera market. Due to many companies innovating the types of cameras they are releasing, there have been inexpensive, full-frame cameras already on the market. When it comes to the EOS RP, the features tend to be similar to older models but for a cheaper price point and a mirrorless design. If you are familiar with a few Canon models, you will read that the EOS RP has the same 26-megapixel sensor as the EOS 6D Mark II that came out in 2017. It also has some qualities that aren’t top-notch like a lower-resolution EVF, a small battery, and low-quality video features. Regardless of its recycled tech and lack of top-quality, it still sells because of its affordable price, compact size, and full frame sensor. The EOS RP has a small build, even smaller than Canon DSLRs with an APS-C sensor. And even with its compact exterior, Canon still was able to make its other features, like buttons, viewfinder, and screen, a fair and convenient size for consumers. It even has a comfortable grip while still being small. The grip itself is pretty comfortable but might not be as comfortable with larger lenses. Though, an optional grip extender is available for purchase. Even with the all-plastic construction, the RP feels solid while being lightweight. There aren’t many creaks or cost-cutting in the exterior which makes it have a clean look. Although the camera does not have weather-sealing – with the price, one cannot complain too much. The good thing is the RP lenses have a gasket that stop dust and moisture from getting in and accumulating around the mount. The rear screen is a great responsive screen, which makes it easy and smooth to use. When it comes to the electronic viewfinder, it has a lower resolution but nonetheless, it portrays vibrant color and contrast. This is all thanks to the OLED panel. What you must be careful with is the fact that the eye sensor does not disable. The rear screen is able to flip out but if you move the camera too close to your body, it could deactivate the screen. It’s safe to say that the EOS RP is catered towards those who are entry-level when it comes to using a camera. 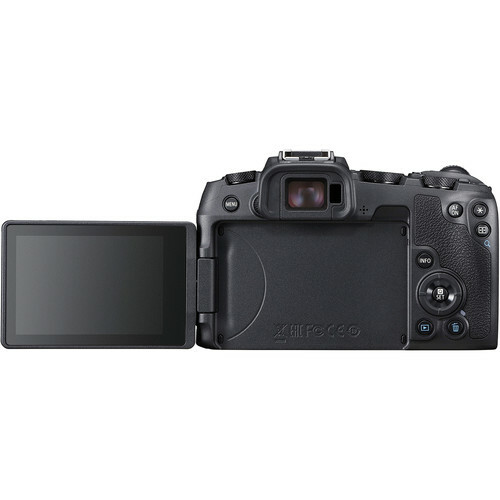 And even as an entry-level camera, its connectivity options are full-featured. There is an HDMI port, a microphone jack along with a headphone jack, and a remote jack. It also has a USB-C port which is a modern port and allows USB charging. WiFi and Bluetooth LE are available with the EOS RP with the setup is simple and straightforward. You can download Canon’s Camera Connect app which will allow you to see and download image on the camera along with using your smartphone as a remote. The battery life on the RP isn’t as great as one would think. The camera uses Canon’s LP-E17 battery pack which has been used in numerous rebels and EOS M-series cameras. What makes RP’s battery drain quicker is its hungry sensor. Because of the sensor’s size, the battery life is about 250 shots. And although there is a USB port on the camera, the RP tends to be a bit selective about USB charging. If you had the EOS 6D Mark II then image quality will be a bit similar with the EOS RP. As both models share the same sensor, this should not be much of a surprise. Although, the RP does have an updated processor so there are some differences. When it comes to the image quality and figuring out whether to shoot in JPEG or RAW, just know that both are quite the same. And that isn’t something a consumer would want, especially if they are accustomed to shooting in RAW and get JPEG material. The RAW quality isn’t up-to-par for its format so shooting in either one, you won’t get much detail as one would think shooting in RAW. With that being said, the RAW format definitely does not compare to its competitors like the Nikon Z6 or the Sony A7 III. But of course, these are much more expensive models. Aside from its image resolution, the full-frame sensor does make up for it. The sensor does an incredible job as focusing on subjects when you want a thin depth of field. This will evidently reduce your time in post-production. Canon really did not wow the audience with the EOS RP. But yet, it’s still a model that must be talked about. There wasn’t anything revolutionary. A lot of the tech and features that were put in this camera has been seen in other models. But what made people look into the RP was its full-frame sensor for an affordable price while still producing excellent content.